Tons of meet records were broken this year. Among the top was Daishon Spann's 800m meet record in a time of 2:14.98 -- this performance earned her the Florida no. two spot right behind Tsion Yared's 2:14 earlier this weekend. North Broward prep alumna and UCF athlete, Katie Pinnell, held the 800m meet record in a time of 2:19 from 2017. Spann took the win and five girls went under 2:30, an excellent start to the season. Kerrigan McGreevy broke the girls 1600m record, running a time of 5:24.85, breaking the record of her teammate, Nichole Santos, from last season. McGreevy led the way with Dillard seventh grader, Christiana Coleman taking second in a time of 5:26.30. Father Lopez freshman, Mary Peck, broke the 3200m meet record, racing her way to a 12:00.57 win. American Heritage seventh grader, Ashley Fitzgerald, came back from er 2:26.69 800m to place second in the 3200m running a 12:13.06. Fort Lauderdale HS broke the meet record in the 4x400m running a time of 4:24.57. Dillard HS broke the meet record in the 4x800m and DMR running 10:19.83 and 13:18.30. Elite performances met by the Florida 2008 Elite Standards. Sebastien Cantave broke the boys 800m meet record, running a new time of 2:04.11 to break Sam Rosenthal's record of 2:04.41. The 1600m was where the bulk of the elite performances came from on the boys side. Garrett Ricardo, out of Flanagan HS, broke Nicholas Rischar's meet record of 4:28.51, to run a time of 4:28.14. Michael Fiore, Sage Brands, and Lovensky Demelien were the next three athletes and all earned elite performance standards by the Florida 2008 Elite Standards. 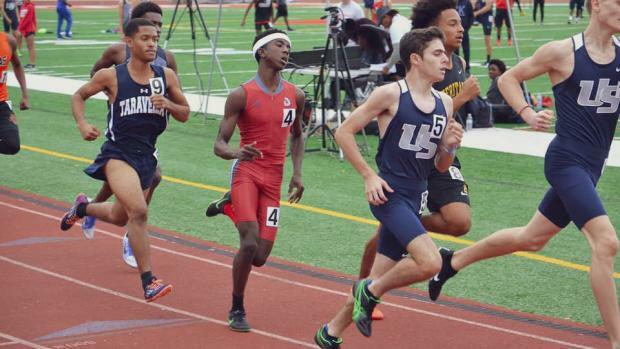 Fort Lauderdale HS and Christopher Columbus HS ran elite performance standards and broke the 4x1600m relay meet record, going 19:12 and 19:18 to start off the season. These teams, along with American Heritage followed up with very strong DMR performances to cap off the Distance Carnival.